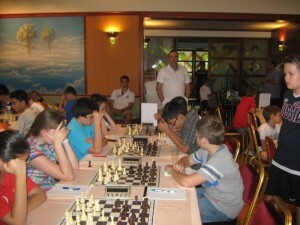 Four players win gold a round before the end of the European Schools Chess Championship. With more than 1 point advantage ahead of competition, we have the first winners of the groups. Impressive performance by Wassel Bousmaha (France, U7) and Andrey Esipenko (Russia, U11 open) guarantees them gold medals with perfect 8,0/8 in the respective groups. Defne Sade (Turkey, U9 girls) also secures a gold medal a round before the end with 6,5/8, which is 1,5 points ahead of competition. CM	Cankut Emiroglu (Turkey, U17 open) with 7,5/8 is also 1,5 points ahead of the chasing pack, getting the gold medal of the championship. Round 9 is to be played tomorrow, see the full results at the official website.